A mock-up of a weapon from Bioshock 3? A radioactive steampunk fish tank? The glowing engine of a recovered Area 51 spaceship? The answer may shock you. Actually, it almost certainly will. What we have here is a mercury arc valve rectifier, a device that became prominent in the 1920s and 1930s for converting alternating current into direct current. The spectacular machines could be found in power stations for electric railways, streetcars, and locomotives of the day. 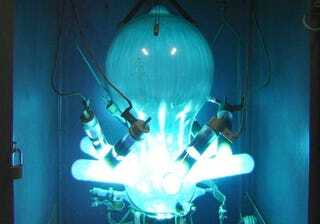 One type of mercury vapor electric rectifier consists of an evacuated glass bulb, with a pool of liquid mercury sitting in the bottom as the cathode. Over it curves the glass bulb, which condenses mercury evaporated in the course of operation of the device. The glass envelope has one or more arms with graphite rods as anodes. Their number depends on the application. If direct current is to be produced from single-phase alternating current, then two anodes are used, each connected to the outer ends of a centre-tapped transformer secondary winding. With three-phase alternating current three or six anodes are used, to provide a smoother direct current. Six-phase operation can improve the efficiency of the transformer as well as providing smoother DC, by enabling two anodes to conduct simultaneously. During operation, the arc transfers to the anodes at the highest positive potential (with respect to the cathode). Design of the arms and envelope is intended to prevent an arc from forming between the anodes; such a condition is called "backfire" and is a critical factor in the design of mercury arc rectifiers.